My RC Helicopter tips eBook will give you all the help, information, & procedures required to correctly setup your collective pitch RC helicopter. For newbie beginners looking for the perfect trainer settings, right up to more advanced setups for general/scale, sport, & 3D flying styles. Once you understand these CP setup fundamentals, you will use them throughout your collective pitch career on every single RC helicopter no matter where the hobby takes you. That's not where it ends however. In the beginning I was just going to write a short & easy to understand collective pitch RC helicopter tips help guide. Something a beginner new to collective pitch could easily digest, yet sufficiently covered various setups for pitch and throttle curves, dual rates, etc. Providing a solid understanding how all that is achieved; both mechanically, and in conjunction with computerized radio programming. The eBook still covers all that. Early into the project, I soon realized that information alone was only scratching the surface of the collective pitch learning curve. Many more common questions and concerns emerged as beginners quickly progressed into intermediate and seasoned pilots; that material had to be covered as well. Micro's up to 800's and all electric sizes in-between; even areas of fuel powered are covered. I'm not going to waste your valuable time on an endless promotion page for this RC helicopter tips eBook. I understand if you have made it this far in your search for information, you don't need (or want) to be bombarded with more. This e-book is the result of many questions I have received about how to properly set up a collective pitch RC helicopter for training purposes, general flight, and aerobatics; as well as many other specific “how to” questions in relation to collective pitch helicopters. The main focus is on electric power because of the growing popularity, but many of the setup procedures and tips are just as applicable to fuel powered machines as well. The great thing about all good quality collective pitch RC helicopters is how adaptable they are. This holds true for any size collective pitch RC heli - from a tiny Blade Nano, up to an 800, or even larger. From scale to sport, trainer to 3D – one heli can do it all. The problem is most instructions are very vague in how this is achieved or simply don’t even make mention of this wonderful benefit. Worse yet, most ready to fly (RTF) models come out of the box setup for more advanced flying. If you're lucky you might get a fairly tame "normal flight" mode (that's even too aggressive in my opinion to learn basic hovering exercises on), but most will be setup for full on sport or aerobatic flight making them overly responsive to learn on. Bottom line... There is absolutely no reason that you can’t successfully learn on a higher performance machine and have a lot of fun doing it (so many of us have) if you have it set up properly. However, if you don’t tame this high performance bird down, you will almost certainly over control it and crash; perhaps even give up all together with the costs and frustrations involved in crash repairs. There is absolutely nothing fun about crashing and no matter how experienced and good you get at flying any RC model; the feeling of despair is always the same. In fact, it usually gets worse as you progress in this hobby since your models generally start costing more and you will usually know exactly what you did wrong to cause the crash in the first place. Yep - the old “that was stupid” statement is muttered under your breath or perhaps some stronger and more colorful language is used - planes or helis, it makes no difference. 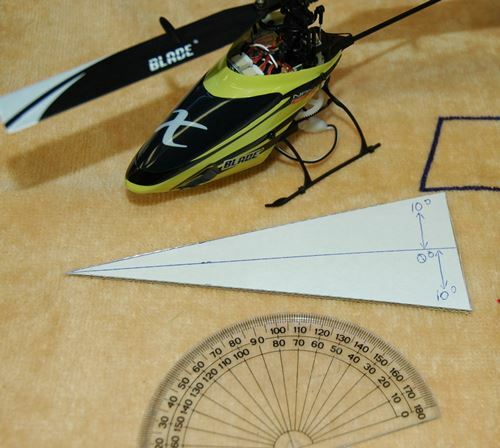 The good news with all RC helicopters is that repairing them is pretty straight forward and once properly repaired; an RC helicopter is 100% good as new - something that is rarely achieved when making repairs to fixed wing RC aircraft. As I indicated in the opening chapter, micro collective pitch setup really doesn't differ much from the larger birds so this is going to be a short and sweet chapter (I hope). In most cases the exact same pitch curves, throttle curves, and dual rates all work equally well with the micro stuff the same way it does with the bigger stuff (I will point out the few differences). As I said, this really surprised me because all along I had read and heard high ripple goes hand in hand with high power/acro flight, but running very low head speeds and starving the motor under high rotor loads is just as capable of producing some respectable ripple numbers. In short, tame flying can produce it as well! Once I installed the Cap Pack however on this particular bird, those numbers with the same tame throttle curve dropped to under 2V. I just wanted to point that out to illustrate that even if you fly tame/normal type flying, you may be generating substantial ripple depending on your particular heli setup, motor, gear ratios, and even the way the ESC is programmed. There are just so many variables, but post flight data logs can certainly help you see what's going on and identify potential issues just like this particular example did for me. I get so many lubrication questions and rightfully so; if you ask 10 different people what their RC heli lubrication recommendations would be, you will likely get 40 different answers. I personally don’t feel there is a perfect lube for everything and I have tried them all (3 in 1, Tri-Flow, silicone oil, silicone grease, silicone spray, ATF, high quality bearing grease, lithium grease, synthetic oils, waxed based lubricants such as White Lightning, etc, etc, etc). It's usually caused by dirty/worn potentiometers (pot sliders) in the servos and almost always happens more around the center neutral position because that is where most of the fine servo movement occurs. You don't see this as much with the fixed pitch flybar micros; only the flybarless ones seem to be an issue because as I just mentioned, the flybarless system is always sending constant small commands to the servos to stabilize the heli, and that tends to wear/dirty up the pot sliders faster. 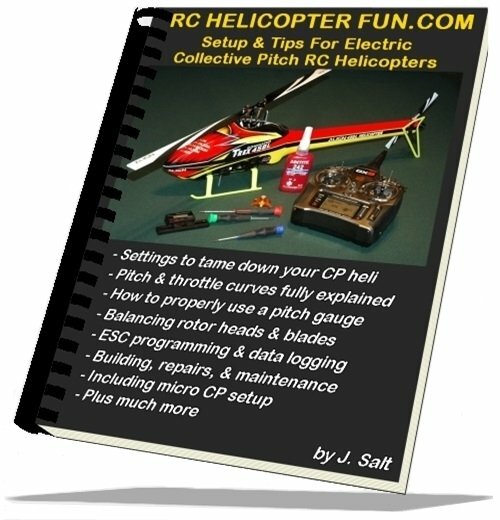 For $18.95 you get an easy to read and understand source of collective pitch RC helicopter tips helping you avoid many of the common frustrating mistakes that so many unfortunately experience when trying to self learn all this stuff on their own. This eBook will help you shave months off the collective pitch learning curve and will likely save you a fair amount of money in the process. "I want people to succeed in this hobby"; and sincerely hope that with the help of my little eBook here, you will not only be successful with collective pitch, but also have a lot of FUN while learning about it! 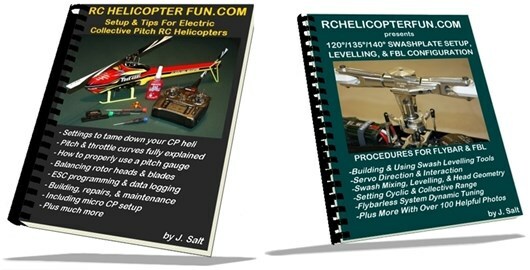 This RC helicopter tips eBook is offered in PDF format Only (no hard copies are available). If you don't have a PDF reader you can down load one for free from Adobe. There are also PDF Apps available for tablets and smart phones if that is how to wish to view the ebook. To Order, simply click on the Buy Now button below and be reading your own copy of my Collective Pitch RC helicopter tips eBook within minutes. Save 25% With The "Setup Combo"
Are you also interested in my Swashplate Setup & Levelling eBook? If so, you may wish to take advantage of my "Setup Combo Package", which includes both of these popular eBooks for one low price. If for whatever reason you don't find the information in my eBooks helpful and useful; simply contact me within 30 days from the purchase date and request a refund along with the original transaction or order number and a simple explanation of why you're requesting a refund. Happy Reading and Happy Flying! Hi John, I have been flying helis for 5 years and have many books. Since getting your ebooks yesterday I have not put them down. They are by miles the BEST instruction books on the subject I have ever read. The clear descriptions of the various setup functions have revolutionized my models. I reset three swashplate heads last night on my Trex 500, Trex 250 and blade SR and flew all of them this morning WOW what a difference. Dual and expo have never been better described and so easily understood. I had to email you to thank you and congratulate you on such fine work. My only wish is that I found your RC helicopter tips work earlier and saved a lot of heart ache and expense. These should be standard reading for ANY Heli flyer. Once again a thousand thanks. John, there is no way I can say enough good things about your book I just purchased. I have been so frustrated by my helicopter (HeliMax 450) that I sat it aside 7 years ago while it was still in one piece. Just recently decided to have another go at it and was again immediately ready to give up. Could not get the Gyro to work correctly even though I have Don Edbergs book and the Futaba instructions. Whatever I did, nothing worked. After 10 minutes with your book, problem solved, Gyro works as it should. Your book is so full of really great ideas and tips that I am in awe. The tip on keeping some positive pitch at the bottom station on the collective stick for the inevitable panic shut down while learning to hover is so simple yet neither my flying partner nor myself ever thought of it. I have been in the RC hobby for 45+ years, sport, pattern, sailplanes and the only thing that ever got the best of me was the helicopter. Not any more! I have pushed a lot of money across the counter over the years but, by far and away, this is the best $20.00 I have ever spent. Ever! Many,many thanks to you. Hey John, just wanted to let your visitors know the CP Heli setup e-book is super informative and helpful. Your book actually taught step by step what all these settings on or transmitters do. This book saved me countless hours of web search and spared me crashes. Already Flying proficient and ready to tame more cp helis. This was certainly worth the $20, it would be worth $100 to me. Hi John, Recently purchased your setup and tips for cp helis book and just wanted to say THANK YOU VERY MUCH. Without the book and your website I don't think I would be able to hover my newly purchased nano cp s like I can. Thanks again and please keep up the great work! John... I can't say enough about the help you have been with my endeavor to become an RC Helicopter pilot. I have a 130 X and because of your e-book on Setup & Tips for Electric Helicopters I set it up for training and it has made the adventure fun, rewarding and exciting. Your numbers hit the mark perfectly. I visit your site on a regular basis to learn more about the hobby and I tell everyone about it. Keep up the good work and THANKS. Hi John, I bought your e-books and they continue to be the best thing I've spent money on in this hobby. Hard to believe last November I bought an MCX, then an MSR, a MiniTitan in February which I learned to hover on, then a Blade 400 on a whim (and your recommendation). When I set up my MiniTitan with the ultra conservative 'learn to hover' set up you had...holy cow! I swear that thing was as easy or easier to hover than an MSR, stunning really. I was completely chicken s..t to go into forward flight but one day I'd had enough, took the Blade out and followed your directions and its been full speed ahead since :). That Blade is a hell of a lot of heli for the money. My buddy had only an MCX and wanted to dive in. We went and got him a Blade 400 RTF, did the John Salt especial settings and that guy wouldn't stop talking for hours he was so jazzed when he hovered it :). Now I'm finishing up an E620 Raptor, I cant wait to fly it. Hi John, I would just like to say that your ebooks regarding heli's are the best guidelines and help that I have discovered on the internet. I have now got to a point where I can do my own setup and not rely on someone else. Your videos on learning how to fly really makes learning how to fly a lot more fun with very little stress. Congratulations and keep it up. I have introduced quite a few friends starting off to your website, and everyone rates it no.1. thank you from here on the East Coast, Father born in Trail BC though. Anyway back to my thank you, for of course both your site, and your e-book selection. After waffling over your setup book for at least six months, I thought oh well, you're missing something, and I won't find out what, until I find it. It was in that wonderful book. What was it? Confidence! Confidence your radio setup is going to keep all that "look what I can do" that is locked up in that 450, 500, 600 whatever Trex, Goblin, Mostro whatever; and believe in your heart that it is still there, but you can control its leash. I am on a system that has "Radd's School of Rotary Flight" Consume my first 5 to 10 Packs, then on to day three and beyond with your program. Meanwhile Finless Bob oversees all my builds. You are a very special part of this community of flight. Thanks for keeping us 57 year old dreamers from crashing senselessly. Dear John, I got all three of your e-books last week. They're great. 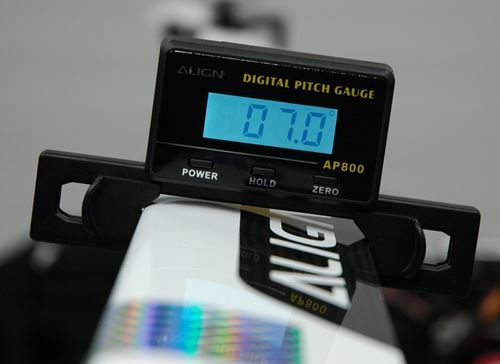 The training pitch and throttle curve values are essential for any newbie to rc heli flight. So is the training gear!! I built the training gear and set throttle/pitch values as per your books. No more crashes!! John, I bought all of your ebooks, read them each twice, bought a Trex 450 Pro and Spektrum DX8, as well as the Phoenix simulator, and I'm happy to say I finally hovered yesterday! As you predicted, it was truly exhilarating! The whole process was time-consuming and challenging (Chinese does not translate to English very well! ), but I wouldn't have gotten through it without your ebooks, and in the end it was worth it. I expect to get a degree of mastery with the 450, though the full 3-D flying thing looks a bit over the top, then look to get a smaller heli for indoors and a larger one for the local flying club field, which has a fair amount of wind. No doubt that assembling and trouble-shooting has helped me understand helis better, and I anticipate the next time around will be easier (but no doubt have it's own set of challenges). Thanks for your help! to this point (especially without crashing) if not for the advice provided in your books and on the website. Thanks. As a noob I came looking when I couldn't hover my Heli-max Novus CP for love or money. Initially, I was a little put off, thinking you were just hawking e-books. But then I read the site, and bought your "set-up" RC helicopter tips ebook, and the information you provide is phenomenal. Excellent stuff!! Thank you so much for the time you took to provide this material. I just bought your RC helicopter tips e-book. I am a newbie to 450 size helis (as you can tell by my e-mail address I have been a coaxial guy for a while). WOW! what a wealth of info. You break things down much further then anyone else I have found. After reading you e-book I not only know what and how to change something, but why it needs to be changed. I think it should be Federal law that if this is your first 450 size heli you have to read this e-book LOL. Your e-book takes the frustration out of learning to fly a 450 size heli. GREAT GREAT product. Also love the website. Hi John, Just had to let you know that your opinion and guidance was spot on, I found the blade 400 with your tame beginner settings much much easier to handle than the blade SR out of the box, or my Honey Bee FP V2 for that matter. It was just so smooth, solid and calm I was amazed. In fact it was a complete revelation, here was a full 3D, powerful, agile CP heli that was controllable and docile, in the hands of a complete CP newbie. Frankly I was over the moon, as this was the first attempt with this heli and I was able to hover, even if I didn't hover for any longer than 30 seconds at a time, it was way way better than the SR and the first enjoyable experience with a full CP heli. Thanks, very much John, as without your RC helicopter tips DX6i settings I know it would have been another crash & burn experience. I just purchased your e-books on collective pitch setup and mSR RC helicopter tips. I have e-mailed you once with questions on the Blade 400 and Spectrum DX7 transmitter. I am a beginner with helis but not fixed wing RC. Your web site and books are outstanding. I have no trouble flying the MCX or MSR. I bought into the advertising on the SR. I do not agree that it is the next step. I can hover it barely and it would not fly it in any kind of wind. Now the Blade 400, set with your instructions is a beginners dream. I'm using the DX7 Acro, your setup, and flight school. I'm going slow and fly daily. I think the SR is too small and not easy to fly as setup. Maybe in a BNF with the DX7, but why when the 400 with your setup is the perfect beginners helicopter. Many thanks for your books, out-standing articles, and web site. John, I purchased your "Setup & Tips for 400 Size RC Helicopters" and have to say it has been the best purchase I have ever made. I got a Blade 400 for Christmas and since then, have never been able to keep it in the air. I have spent over $400 fixing it. Today, after I bought your book, I took my heli out to the field and went through and entire battery IN THE AIR!!! I thank you so much for your help and this book. Hi John, I just purchased your RC helicopter tips ebook and have read through most of it. Prior to reading, the jump from a FP trainer to a CP machine seemed daunting due to the complexity. Having read your book, I feel that I now have a solid foundation of knowledge and an excellent reference for setup and repairs. I appreciate your presentation style and acknowledgment that some things are subjective. Where you do present your opinions, you provide some explanation behind them as well. I was originally leaning towards the Trex 450 Sport since it seems to be "the" thing in class, but the eFlite 400 had some appeal since it's well supported by the local hobbyshop (and only hobbyshop within 25 miles). Your ebook made me a lot more comfortable with the eFlite as being a good entry-level CP heli, but one capable of advanced flight as well. Anyway, thanks for the great website and the excellent ebook; it was well worth the purchase price! John, I found your website last night and it didn't take me long to order two of your RC helicopter tips e-books. I was a bit skeptical that I might be wasting my money on the e-books, but I felt that at the very least that money would be well spent if for no other reason than to give you some payback for the INCREDIBLE information you have put together on your site. I'm happy to report that my money clearly wasn't wasted. Your e-books are just as good, if not better than your website. I started my interest with the micro E-Blade MCX. Your terrific guidance has given me the courage to take the next step and I've ordered a Blade 400. Thank you for giving me the tools necessary to begin this journey. Additionally, I'd like to commend you for linking to Red Rocket Hobbies. I had a rather unfortunate experience when I ordered the MCX from another vendor. 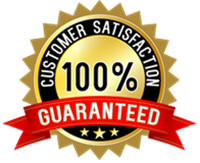 I was very impressed with the speed and professionalism that RedRocket has demonstrated as they handled my subsequent orders. They are now my go-to source. John, I just had to let you know how much your RC helicopter tips e-book helped me. I bought a Blade 400, but as you know it is a bit much for a beginner. The new settings made my Blade the perfect trainer. I am flying it all the time and enjoying every minute. Your e-book was EXACTLY what I was looking for. THANKS AGAIN!! John, I'd thought I'd give you an update of my progress, since I used your website and ebook to take my first steps into this hobby. I'm on week 4 now, and I've run about 70 batteries at this point on my Blade 400. I'm well into FF flight, nose in hovering, figure eights, and stall turns. Oh, and the training gear came off earlier this week. I've cranked my head speed up a bit in anticipation of moving to idle up in the next week or two, and I hope to attempt my first roll. Since I approached my training systematically with the help of your website, the simulator, and proper setup on my Blade 400, I haven't had a single crash yet! (knocking on wood). It will happen as I push myself harder and harder, or have a mechanical failure, or just do something stupid). Thanks again for all the help. You successfully launched this student into the hobby! John, Thank you for writing such a great informative book on collective pitch RC helicopter tips. I have been flying a Blade 400 indoors in the large gym of the school where I work. I have learned more creative ways to crash than I care to think about. The manual that comes with the kit does not give enough information to be useful to me and I have searched all the local hobby shops looking for a book like yours. Today a co-worker showed me his copy of your book and it was exactly what I had been looking for. Thank you for sharing your knowledge and experience for all us frustrated beginners. I will be sure to pass on your address and information on how to get your book to all my frustrated fellow flyers. At 12.95 you are charging one third of what all the "how to" books cost and yours has all the information that they do not have. Again, Thank you. John, I have read and re-read a lot of information on the net. I love to read and have read everything I could find on the net and ordered books and video's, read and watched them also. Your site and the RC helicopter tips booklet have been more help to me than all the other information put together. There's a lot of stuff out there, some of it not too good and some just pure junk, not worth the time it takes to read it, but I've put the flying lessons and Blade booklet into page protectors in notebooks and read and refer to it every day. I've highlighted section and memorized a lot of it, now if my brain and fingers would just do what my eyes want them to do. BIG learning curve. Thanks a million for all the information. John, I've purchased your RC helicopter tips e-guide some 10 days ago. The process was fast and easy. I must say that it was money very well spent. The pitch and throttle curves are extremely helpful. I managed to tame my heli (3D Storm by JP Perkins - English make size 450) considerably using your settings. Also I was flying exponential and switched to dual rate. We had fantastic flying weather and managed to fly several packs a day. The progress is enormous. Before these settings converting my flying skills from the simulator onto my heli was difficult (and frustrating). Now this is no longer the case. I am amazed of the stability. I purchased your CP RC helicopter tips guide yesterday and wish I had known about this information ten months ago. I am 54 years of age and relatively new to rc heli flying - been flying for almost a year now. I have been going through a very slow progression, both in "Realflight" simulator skills acquisition and actual rc heli models flown to this date: Blade CX2, lipo powered Falcon 40's, Blade CP+, and now assembling servos for my newly acquired Cypher 3D to be flown with a DX6i Tx and 6200 Rx. I have enjoyed reading your "Setups & Tips ...." and found the beginner Pitch and Throttle settings especially useful - as I am not the most skillful heli pilot out there and want my first flights with the Cypher to be calm and relaxed as possible. I know that the Cypher is a hot bird and I just wanted some general guidelines to set it up for relaxed hovering and gentle sport flying. I now realize that I could have probably skipped the CP+ and gone with a gently tuned Blade 400 instead. My local LHS tried to get me to buy the Blade 400 (as he commented that the CP+ could be twitchy and just plain unforgiving) but I did not consider that it could be detuned enough for novice pilots and felt that I should progress with a cheaper option. You are right. The Blade 400 could be marketed to a wider spectrum of lower skilled heli pilots - like myself - if the performance parameters are set correctly. In closing, I would just like to say "many thanks!" for putting this great publication together and making it so easy to acquire over the internet. I highly recommend this publication to anyone thinking about or just getting into RC heli flight. sharing your knowledge in this great hobby. Please keep up the great work. Hi John, i have just purchased your "little book" on RC helicopter tips & found it to be an excellent beginners guide - so much so that i have lent it to my brother-in- law to read because he got one of these little beasties for Christmas. Just for the fun of it I also bought an E-flight mCX for inside practice.